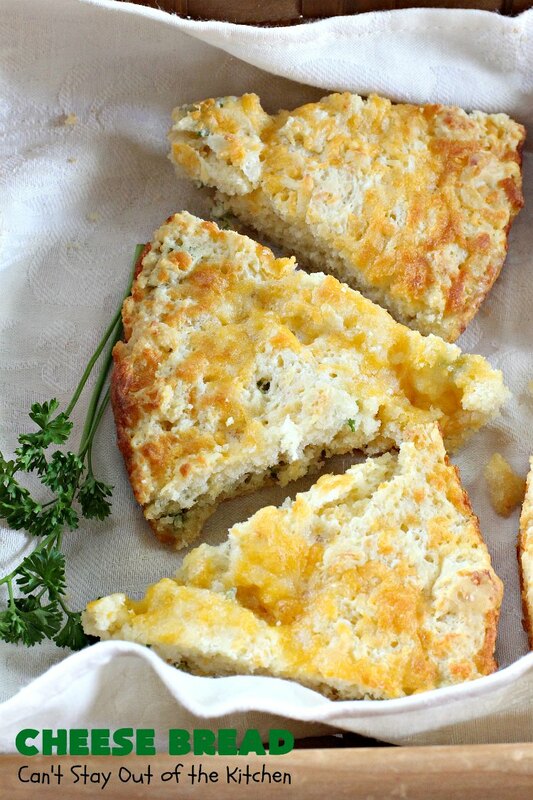 I have a delightful recipe for you today–Cheese Bread. 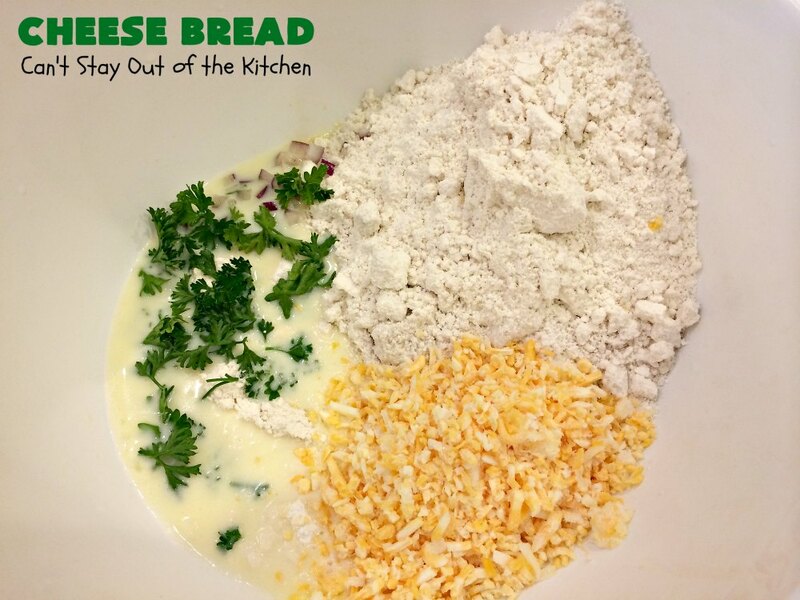 It’s a quick and easy bread recipe. It’s a great side for soups, salads, or main dishes of any kind, including pasta. This tasty bread has only 7 ingredients. 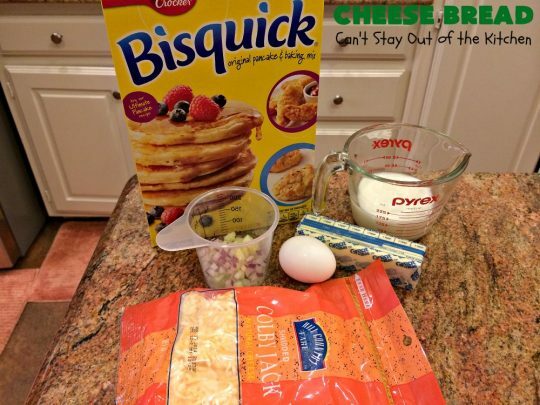 Since it starts with Bisquick it’s incredibly easy. 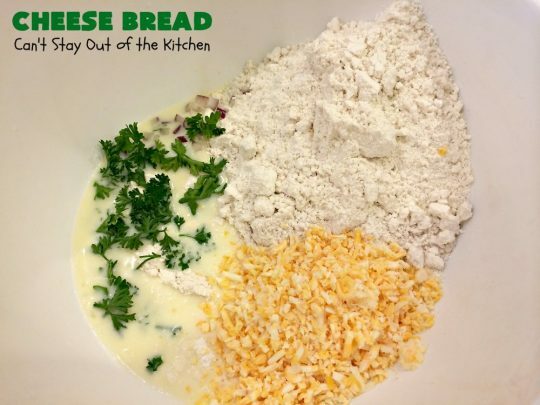 Add melted butter, milk, an egg, cheese, parsley and onions and that’s it! I usually make this recipe in a round 9″ round baking dish. But I’ve also doubled the recipe for a 9×13″ baking dish. It comes out very nicely either way. We served it as both a lunch and a dinner bread. I found this recipe in a local magazine as it was reprinted from an area church cookbook. 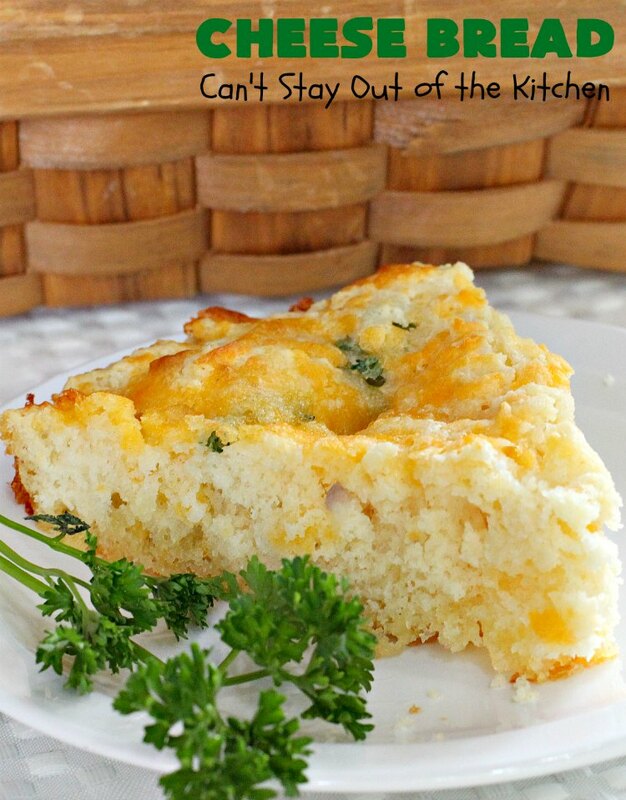 I loved the ease of this recipe. If you want to be adventurous you can add additional seasonings or spices to amp up the flavors. 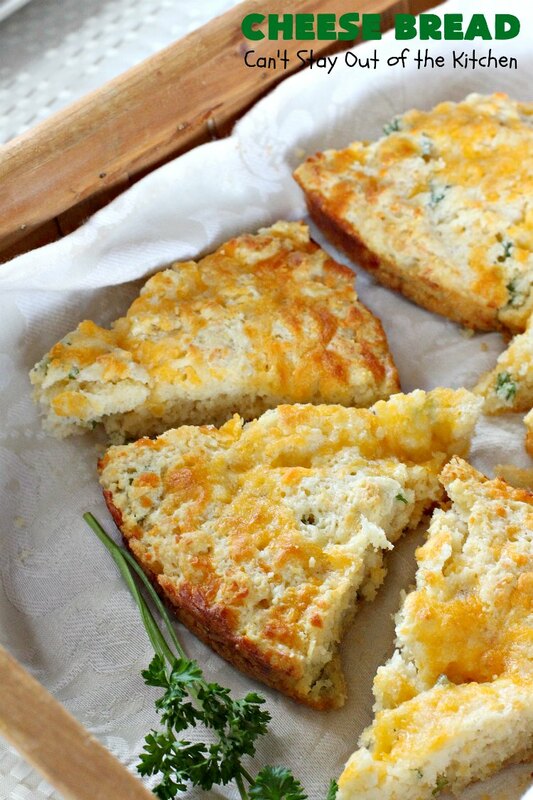 That’s what I did when I made an Herbed Cheese Bread. Although for a bread lover like myself, I really enjoyed it pretty close to the way it was written. I used fresh parsley since I had it on hand. I’m sure other fresh herbs like dill weed, thyme, rosemary, marjoram and even sage would work in this recipe. I was making a meal for someone in August and included Cheese Bread as a side. I nibbled on the crumbs and enjoyed it so much I made the bread again a couple of days later for for a pool party we were having right before Labor Day. That time I got to enjoy several pieces. Yum. This recipe is so quick to prepare. I suppose that’s why I like it so much. 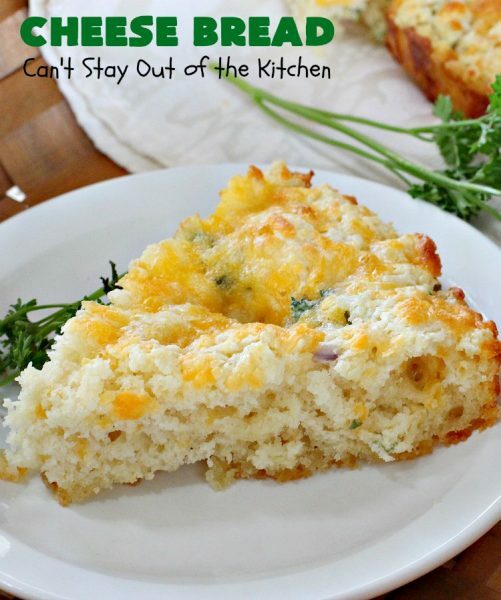 Whether I made a single batch or a double batch, this recipe was oven ready in 10 minutes! This bread was featured on Recipe Lion, here. 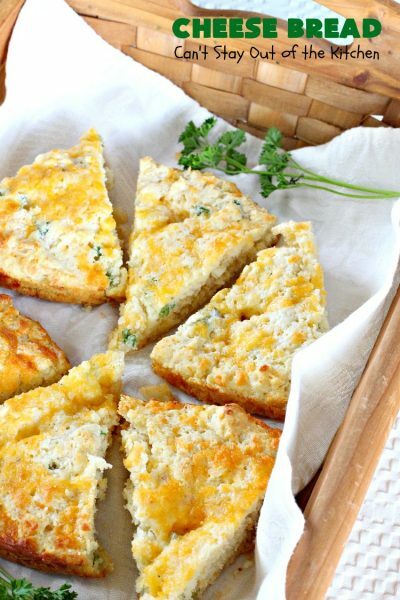 Cheese Bread is a quick and easy recipe. It’s great as a side for any main dish meal. 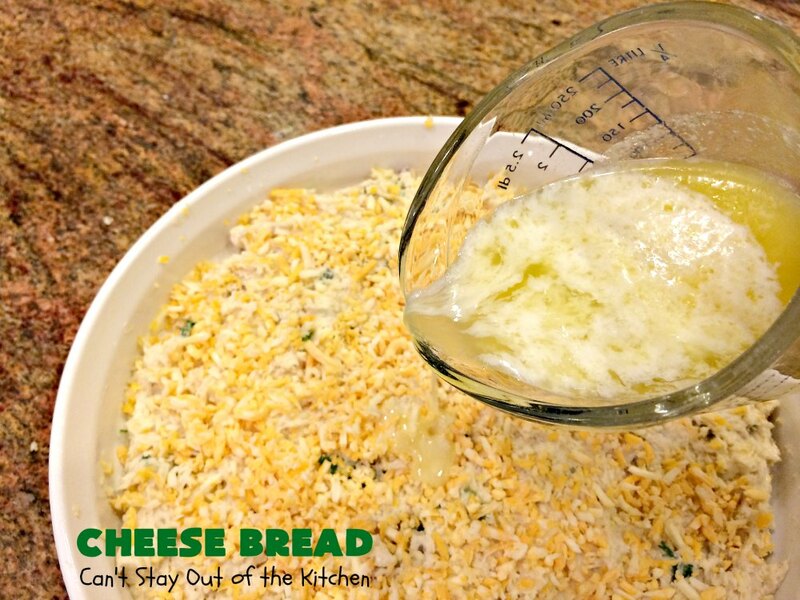 Cheese Bread is not only delicious, it’s economical to make, too. I love a piece of bread along side soups and salads. 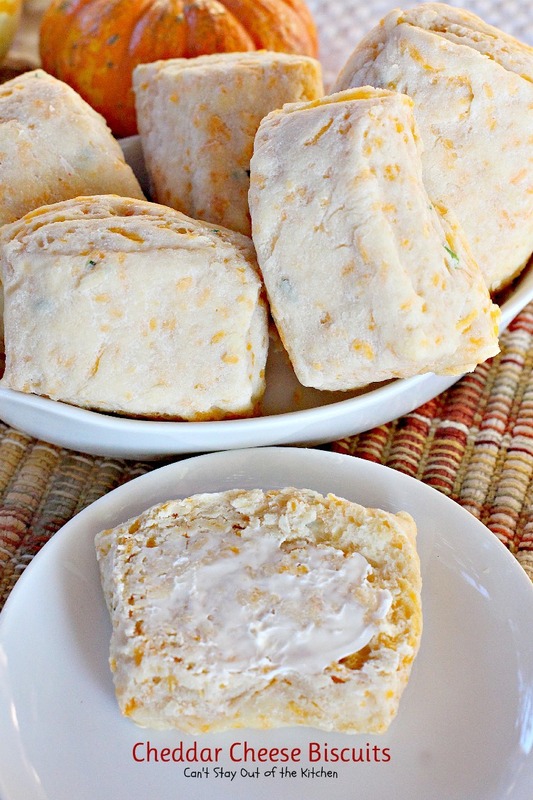 This is a terrific bread to serve for holiday meals like Easter or Mother’s Day. I used these ingredients, plus fresh parsley. 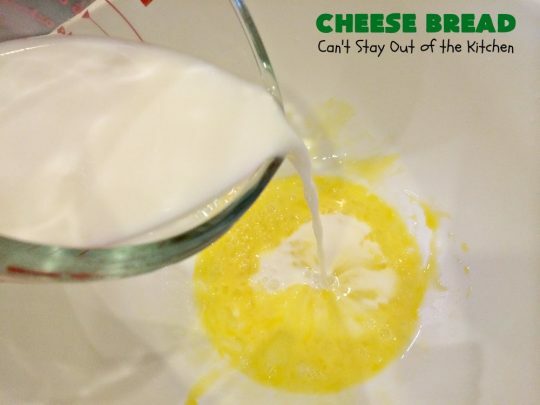 Beat an egg in a mixing bowl. Add milk and stir to combine. Add Bisquick, 1/2 cup cheese, parsley and onions. Grease a 9″ round cake dish or tart dish. Spread ingredients into prepared dish. Sprinkle remaining cheese over top. Drizzle melted butter evenly over the surface. Bake at 350 for 25-30 minutes or until lightly browned. Cheese Bread is a great side to take to potlucks or family get-togethers. 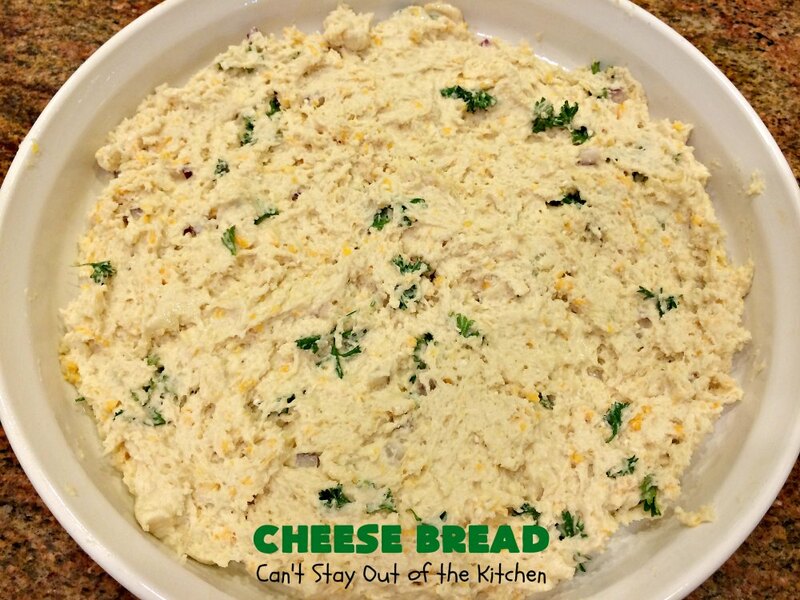 If you enjoy dinner breads with pasta, this is a great one to try. 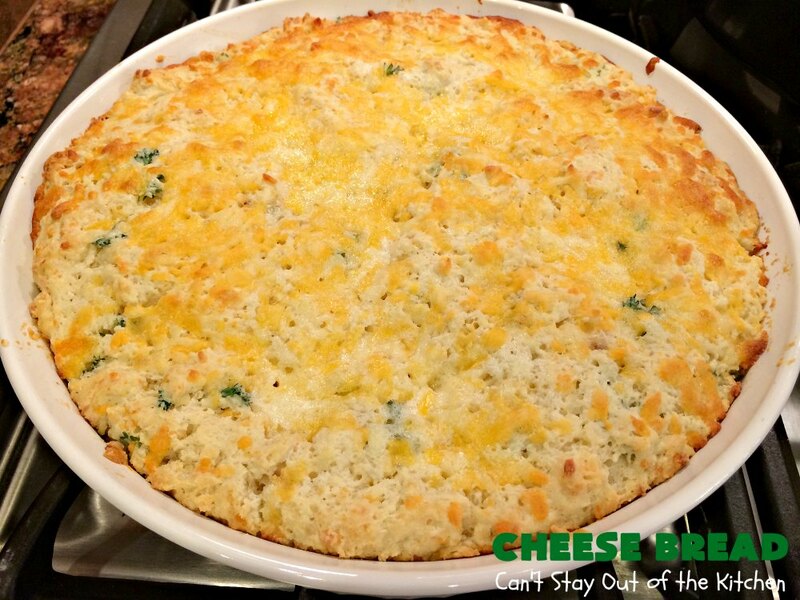 We loved how easy this recipe came together. Tasty dinner bread that's so quick and easy to make because it begins with Bisquick! This economical 7-ingredient recipe uses ingredients you probably already have on hand. 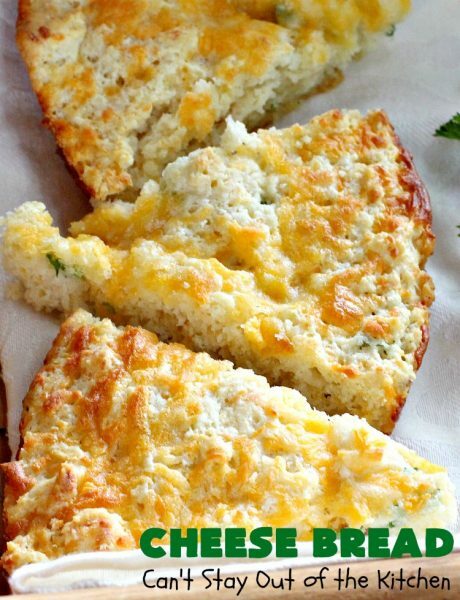 It's terrific for company or holiday dinners like Easter or Mother's Day. Grease a 9” round baking dish. 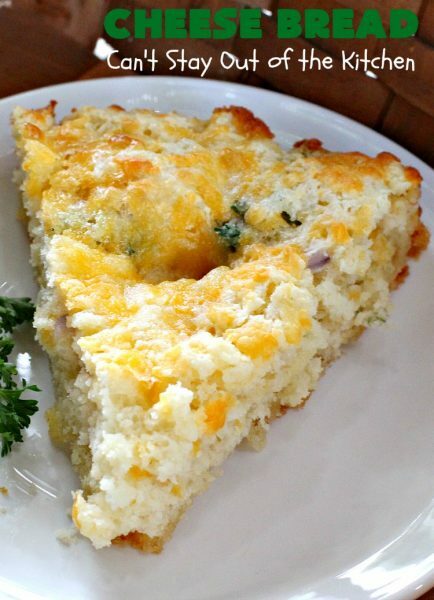 Add Bisquick, parsley, onion, and ½ cup cheese and stir to combine. Sprinkle remaining ½ cup cheese over top. NOTE: This recipe would also be good with the addition of other fresh herbs like dill weed, thyme, rosemary or marjoram. NOTE: Use 1 heaping teaspoon dried parsley if you don't have fresh parsley. Recipe adapted from Living Magazine, November/December 2012. 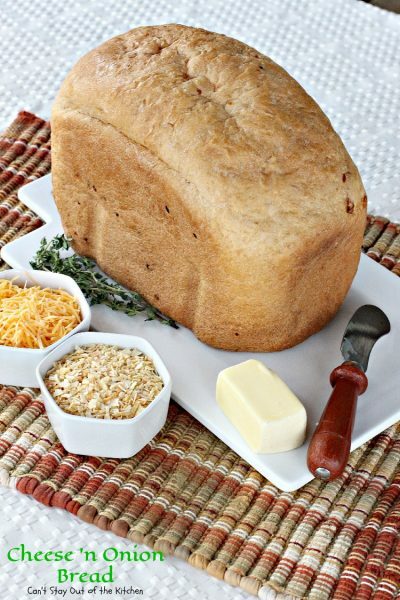 Tasty dinner bread that’s so quick and easy to make because it begins with [url href=”http://www.bettycrocker.com/products/bisquick?nicam5=vanityurl_web_bisquick” target=”_blank” title=”bisquick”]Bisquick[/url]! This economical recipe uses ingredients you probably already have on hand. This recipe would also be good with the addition of other fresh herbs like dill weed, thyme, rosemary or marjoram. [br][br]Use 1 heaping teaspoon dried parsley if you don’t have fresh parsley. We really enjoyed Cheese Bread and think you will, too! 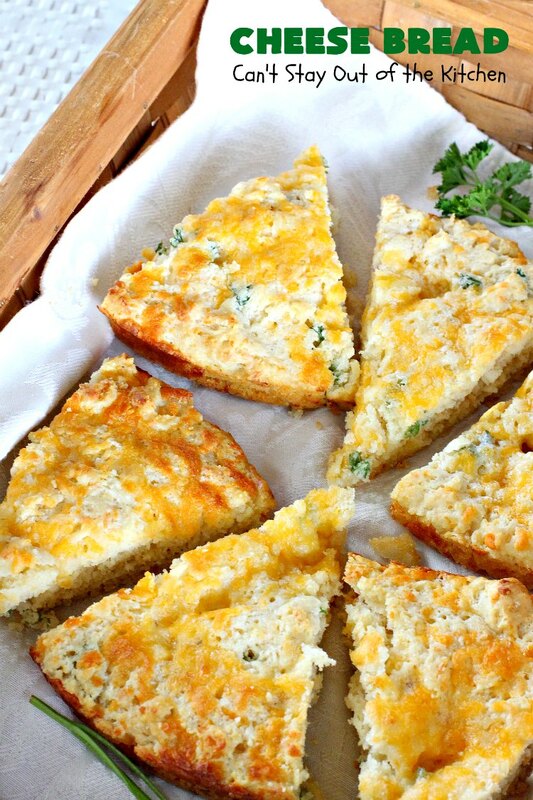 Doesn’t Cheese Bread look wonderful? 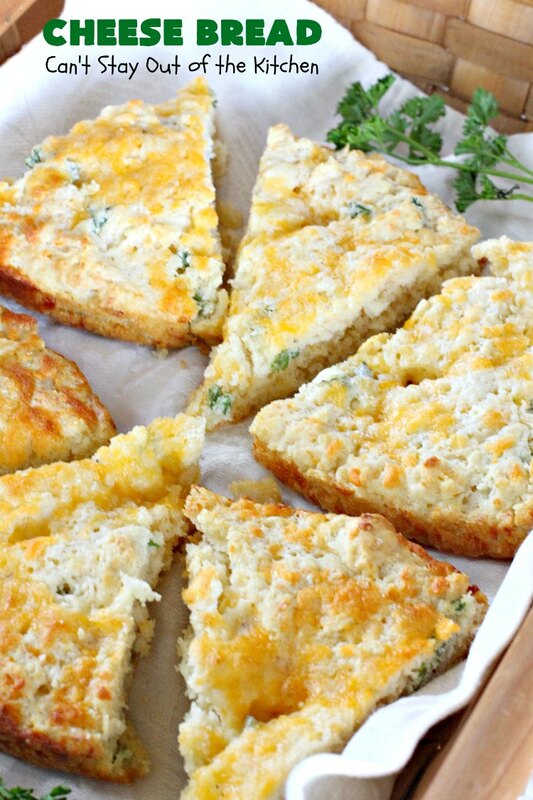 Cheese Bread is great for company dinners, too. Could this be doubled a baked in a 9 x 13 pan? Yes, you probably can but you will definitely have to adjust the time longer. Hope it turns out well, Jan. I made this recipe as written in a 7 x 11-inch baking dish, so doubled might be too much for a 9 x 13. Thanks for the info, Karen. Hi Pat, sorry you don’t like all the intro before the recipe. I patterned my blog 5 1/2 years ago after the Pioneer Woman’s blog so it has a step-by-step how to make it section for all those who are not familiar with cooking. I’ve kept that format because it works well for most blog followers. Enjoy the recipe. Have a great week. Hi, P.J. So glad you like seeing the pictures. While I design those for novice cooks, even those who’ve cooked for awhile like to see the consistency of the dough/batter in many recipes. Thanks for stopping by and letting me know. Thanks, Thahab. Have a great weekend. Hi, Mary, I really enjoyed this bread. It’s almost like biscuits. We enjoyed the texture. Yum! This looks so good, Teresa! Thank you, Nancy, it did turn out well. Thanks for stopping by. You got that right, Shari! I love bread, too. Thanks for stopping by. Hey, how is your baking business going? Rae, cinnabuns50@gmail.com is the address I currently show you’re receiving email for this blog. Are you getting duplicates going to another email address? I checked crharpe2@gmail.com and I don’t show any emails for that address. Let me know what I need to do.